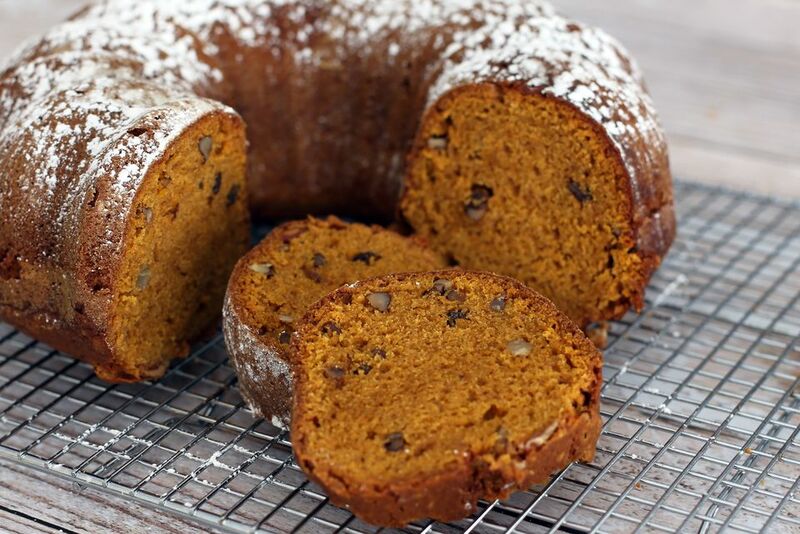 This recipe makes a big spiced pumpkin bread in a Bundt cake pan. The moist bread is filled with raisins and walnuts, but feel free to leave the raisins out or substitute dried cranberries. We used chopped pecans in the pumpkin bread pictured. Serve as a breakfast bread with butter or cream cheese, or gussy it up with a sauce or whipped cream and serve it as a dessert. You could also drizzle a glaze over the pumpkin bread. Take it along to a family gathering or potluck. Heat the oven to 350 F (180 C/Gas 4). Grease and flour a 10-inch Bundt cake pan. In a medium bowl combine the flour, baking powder and soda, nutmeg, cinnamon, cloves, and salt. Whisk to blend thoroughly. In a large mixing bowl, combine the sugar, vegetable oil, and eggs; beat on low speed of an electric mixer or whisk until well blended. Stir pumpkin into the egg mixture. Gradually add sifted dry ingredients to the pumpkin and egg mixture, stirring well after each addition. Fold in walnuts and raisins if using. Spoon the batter into the prepared Bundt cake pan. Bake in the preheated oven for about 1 hour and 15 to 20 minutes, or until a wooden pick or cake tester inserted in center comes out clean. Remove the bread from the oven and cool it on a rack for 10 minutes before removing from pan. Sprinkle the cake with powdered sugar or drizzle with a simple vanilla glaze, if desired. It's wonderful with a flavored butter or cream cheese spread, too! You may substitute all or part brown sugar for the granulated sugar. Use dried cranberries in place of the raisins. Substitute chopped pecans for the walnuts. Freeze individual slices or larger portions in heavy-duty food storage bags or wrap in aluminum foil or freezer wrap. Store in the freezer for up to 3 months. Thaw at room temperature of wrap in foil and heat in a preheated 350 F (180 C/Gas 4) for about 10 minutes.